Starting with the assumption that it is governments and industries that need to take primary responsibility for climate change, Extinction Rebellion is a grassroots movement that works from the basis that the only way to make the powerful take action to reduce carbon emissions and thereby prevent climate catastrophe is to enact repeated and widescale acts of civil disobedience. Protests, individual lifestyle changes and petitions are not enough, they argue, and for this reason, their main aim so far has been to secure as many arrests as possible. Importantly, they frame themselves as an inclusive movement – not least because they see climate change as a global challenge rooted in globalised ideologies of neoliberal capitalism – and recognise that those who are most socially privileged are best placed to put themselves forward for actions that might lead to arrest. They have also cited the American civil rights movement and Gandhi’s non-violent struggle as inspirations for their actions. Appealing to future generations is an astute rhetorical strategy for a movement that wants to marry mass appeal with mass civil disobedience. But why does appealing to future generations seem to make sense and why does it make a movement appealing? What assumptions are carried into the movement with this form of rhetoric? And who counts and who gets left behind by it? Many of the early environmental campaigns that focused on exposure to various forms of pollution framed their appeals for help and redress in terms of protecting children, the home, the family and even the ability to have children at all. In these campaigns, exposure to environmental harms was depicted as a toxic legacy or inheritance. There were good pragmatic reasons for this: in the US, from Warren County to Love Canal, marginalised people were being subjected to environmental harms that posed serious threats not only to the health of adults and children but also to the ability to conceive and bear healthy children at all. But even for those who are in the privileged position of being subject to ‘only’ average risks from pesticide residues, air pollution or crop failures related to changing weather patterns, appeals to save the planet in the interests of future generations are potent. Framing environmental harms as hurting children taps into the widespread belief that children are innocent, or at least less accountable. Actions, even illegal ones, can seem all the more palatable when you’re doing it for the kids. For many, children are the wild, natural and untainted portion of humanity, and so it is not a great leap to associate them with nature. Children also represent the future. Both nature and the future hold great significance in the climate movement in general, and for Extinction Rebellion in particular, as we see in the examples above. Climate change is something that will get worse over time, so will affect younger people more (or for longer) than older ones. Compared to many mainstream environmental NGOs – which span the political spectrum – XR proposes a temporality of extreme urgency, with many saying that there is a maximum of twelve years to prevent climate catastrophe. Twelve years is of course also the span of a childhood, up to adolescence. For many members of the movement, such as Gail, seen in the screenshots above, this is about her specific children and the duty she feels to leave the world a better place for them. 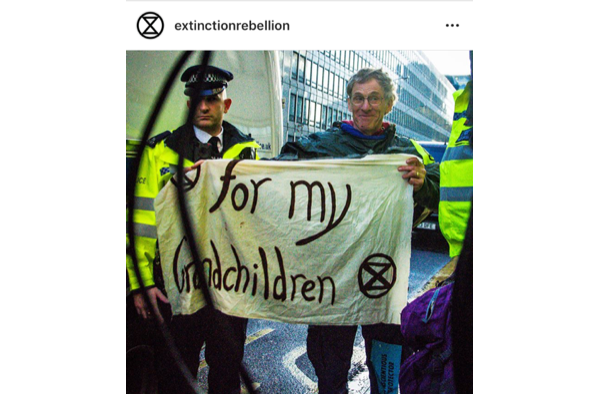 A notable feature of Extinction Rebellion has been the involvement of older people, many of whom admit they have never taken part in protests or demonstrations before. 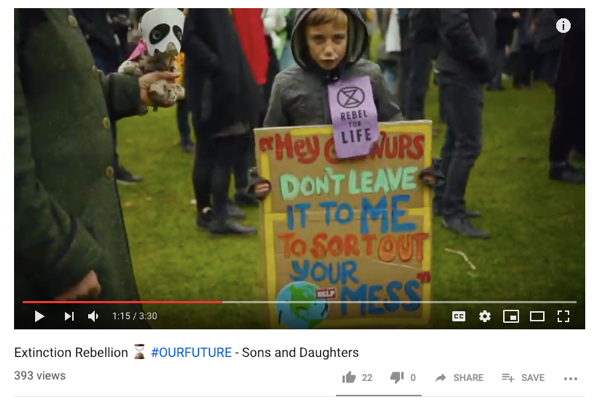 This is particularly apparent in the film, #Elderhood – Grandparents Unite, which can be seen on the Extinction Rebellion YouTube page (and see screenshots below). The generational model of time that frames this video insists that adults must take responsibility for younger people, who are framed as their children, grandchildren or, more broadly, future generations. While blame for climate change is not apportioned to any particular generation in this video, many people concerned about the environment do attribute particular responsibility to the baby boomer generation. This is the generation for whom disposability, consumerism, pro-growth capitalism, economic ‘liberalisation’ and aspiring to social mobility were all normal. However, as with individualised ‘solutions’ to climate change, we must always bear in mind the importance of scale when it comes to attributing responsibility – the true responsibility for the excesses of this generation and the effects those have had on the environment lies with the political ideologies and economic assumptions that drive individual ‘choices’, not with the (vast majority of the) individuals themselves. In the course of writing this blog, I have been bombarded with notifications about new XR events through social media, including an event called ‘The Blood of our Children’. The blurb for this event sums up the tricky tension involved in appealing to the idea of saving future generations, whilst trying to include ‘everyone’. In this symbolic action, members will pour artificial blood on the ground at ‘a central London government location’ whilst also apologising to future generations for ‘our’ (i.e. adults) complicity in creating a legacy of climate crisis. In effect, they are asking those adults who take part to cultivate a sense of parental responsibility towards future generations, whether or not they have children themselves. Similarly, some members of Extinction Rebellion have described themselves as ‘conscientious protectors’, which, along with words like responsibility, duty and sacrifice, suggests a shift in thinking away from the Mother Earth narrative of the past towards something more like Child Earth. What happens to the environmental movement when (adult) activists shift from thinking of themselves as the children of the planet to its parents? Feminist and queer scholars have criticised some environmental activism for reproducing normative ideas of gender and sexuality in their framing of ecological harms. Similarly, if environmentalists appeal to a universalised Child, they can close down debate and make those who appear outside of this heteronormative narrative – those who are infertile, those who do not have children, those whose children have died, those who take care of children or other dependants in unconventional ways – abject. For mass political movements to work, of course they must foster a sense of a ‘we’ who is rising up, who will not be moved, but constructing that ‘we’ in a way that is fully inclusive whilst also building effective rhetoric is tricky. While for some academic critiques might be alienating or disempowering, they are important, because there are critical connections between gender, heteronormativity and the environment, as the writer Maddy Winters has pointed out. That is, the patterns of production and consumption, which are driven by orthodoxies of free market economics and facilitated by political inaction, are closely tied to particular gendered and racialised assumptions about what makes a good life. In other words, these scholars remind us that if an individual is not interested in children, that doesn’t mean they are necessarily any less invested in averting climate catastrophe – nor, importantly, does it necessarily mean that they have any less capacity to help try and prevent it. When thinking, and talking, about links between reproduction, parenting, the environment and climate change, it is important to be specific: it is fine for particular activists to be motivated by wanting to help their children or grandchildren, but it is also important that environmental activists recognise that those who have no interest in children might still care about climate change and that there are close historical and ideological links between the political-economic systems that drive climate change and the heteronormative nuclear family. They must also keep in mind that not everyone can participate in civil disobedience in the same way – whether that is because they have childcare responsibilities, insecure immigration status, disabilities, or have been subject to racial profiling by police. Climate crisis is urgent, but that does not mean that rushed responses will solve it – much as I personally applaud the energy and spirit behind this movement. Climate change is already affecting many and it will affect everyone eventually; this is why universalised appeals seem to make sense – they offer both personal motivation and agency. But, for activism to work, it must be inclusive, welcoming, willing to listen and open to change. Rebel for Life! Rebel for Every Generation!